You're at the airport heading towards the check-in line for your boarding pass — or towards the security line if you printed your pass at home. You reach into your pocket for your ID when you realize you don't have it. What do you do? Take a breath, wipe the sweat from your brow, and approach a TSA agent, because there's a chance that you'll still be able to fly. Your chances will vary, depending on what other forms of ID you have, and whether you're flying domestically or internationally, but where there's a will, there's a way. If you're flying domestically, you're in luck. You'll likely be able to board your flight with little loss of time. If you're flying internationally, there is a chance that you'll still be able to fly, but there will be a significant amount of screening and questioning required before you are let through security without your passport. Don't worry! In the event that you are checking in without any form of valid identification — whether you lost it or simply left it at home — you may still be allowed to board the plane. The TSA officer may ask you to fill out a form and include your registered address, first name, middle name, family name etc. What is the make and model of your car? In which state was your social security card issued? What are your home and mobile telephone numbers? What is your passport number? You might even be asked for the color of your house. After answering as many questions as the TSA officer can throw at you, you will be required to sign a document stating that you answered all of the questions truthfully, and then you will likely be ushered to the front of the security line to continue with the regular security check-in process. Typically, this additional screening won't take more than 30-45 minutes, but it is still a good idea to arrive at the airport extra early — probably four hours or so — before attempting to fly without ID. If you cannot answer (or refuse to answer) the security questions correctly, the TSA officer may not allow you through security. In this case, you will not board your scheduled flight, but you may still be able to board another flight at a later date when you find your lost (or obtain a new) passport. You can do this without completely forfeiting the cost of your ticket. 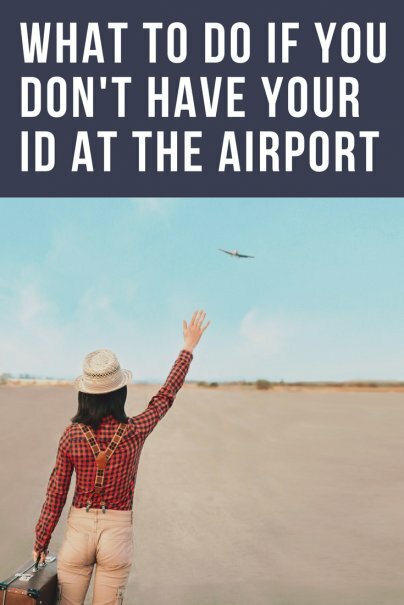 If you lost your ID days before your flight, go and file a police report for your lost or stolen ID. You can then present this to the TSA officer as a form of ID. This will often better your chances of getting on the flight and is recommended for anyone who has no ID at check-in. You may get through the departure gates without an ID, but the real problem may come at the immigration counter when you land at your destination. It is actually up to the receiving country to decide whether or not they will let you in without a valid passport. The TSA agent at your departing airport may or may not help you with contacting the receiving country before your departure. If you just fly with your fingers crossed, you may end up being turned back at the immigration table when you arrive. If the gods are smiling on you and you manage to get through immigration at your destination airport, head straight for the embassy and file for a replacement ID to avoid more bureaucracy and hassle when you leave the country. Did You Lose Your ID Abroad? If you lose your ID overseas, you can get a speedy replacement at the local U.S. embassy. To help speed along the process, come with receipts or confirmation of your exit tickets, a police report of the lost ID (if possible), a photocopy or scan of your lost passport, and two passport sized photos. Typically, a replacement passport can be issued within eight days or less, depending on current demand at the embassy and your particular situation. Always carry many forms of government ID in your wallet (in case you lose your passport). Spread all forms of your ID out in different parts of your wallet and luggage. That way, if you lose your wallet, you'll still have some backup photo ID in your suitcase. Take a photo of all of your government issued ID and save it on your smartphone. Carry your passport, wallet, and boarding passes in one envelope placed securely in your purse or carry on. Leave other ID in your suitcase. Never leave your luggage containing your ID unattended at the airport. Arrive at the airport early, just in case. Double check! It's simple and easy to say in hindsight, but always check your documentation before leaving your home or hotel. If you're flying internationally, you may be in a bit of trouble, but don't panic. Try your best to work through the issue in a calm and composed manner. Yelling, cursing, and overreacting won't help your situation. If worst comes to worst and you are denied the flight, contact your airline right away and explain what happened. Generally, airlines will allow you to transfer your ticket to another flight at a later date. You may have missed your holiday, but you don't have to lose out on your flight cost. Have you lost your ID right before leaving on a trip? How did you handle the situation? This has happened to me. Lost my drivers license somewhere along the way and realized it the morning of my flight. Scrambled to the TSA website and they do give directions on what to do. I got through with an expired Passport and two credit cards. They did ask a few questions about residence, car driven etc. It was nerve wracking but they were pretty accommodating and understanding...I am sure it happens fairly frequently. what ID is expected from young (under 18) travelers? A team of savvy travelers providing personal advice from the trenches.